What Kind of Vehicles Do We Buy? Car Scrap Auckland buy cars, trucks, SUV, Vans. Any makes and models.Whether you have an older car or you are just want to convert your used vehicle for cash quickly, we are here Anywhere around in Auckland. How Much Will We Pay For Your Vehicle? Car Scrap Auckland assess each vehicle individually so that we can give you the highest payout possible. Car Scrap Auckland provide cash for your car the same day that we pick it up. Cash payments can be made or we can send a check with Tow driver who will pick up your vehicle. No There are no hidden charges. Car Wreckers Auckland will remove the car for free from anywhere around in Auckland. Whether you want cash urgently or you want to own a brand new car, getting cash for car from the “registered car wrecker” is always the best option. When it comes to sell out an unwanted car, most car owners post an ad about the car online or sell it directly to the buyers by reading local scrap cars. The downside of these two methods is that you might not get the actual value against the car that your car deserves. Those people will either try to negotiate with you or they can manipulate you by telling lies to get your car from you at most cheaper rate. They use various tactics to buy your car at lowest price. Are you looking for Auckland Cash for Cars? See link below for special Auckland region ONLY site! How about New Zealand Cash for cars? Age: When your car gets older, the market value of the vehicle decreases eventually. The components of clunker, which is about 15 years old, have higher demand than its repair parts. If the parts of an automobile are branded like Toyota or Honda, it means automobile was highly reliable and its components are more valuable for the salvage yards despite of their age because cars can run for several years with these parts. Model and make: If your car has excellently reliable and popular make and model, than you can get higher value of your car from salvage yards. Although excellent reliability is not the quality of a popular model, the reality is these parts demand more after the period of ten or more years after its date of release. Condition: For a salvage yard, it is not mandatory to have excellent-conditioned automobile so that you can get a higher value for your car. Some useful parts like body panels, transmissions, cabin components, and engines which can still be in good condition and are full-functioned can increase the market value of unwanted vehicle. A fully wrecked car is still valuable for auto recyclers because of its useful components. Car Scrap Auckland buy vehicles that are wrecked or have mechanical problems, even if your auto is not running. Get a free online offer anywhere in Auckland. 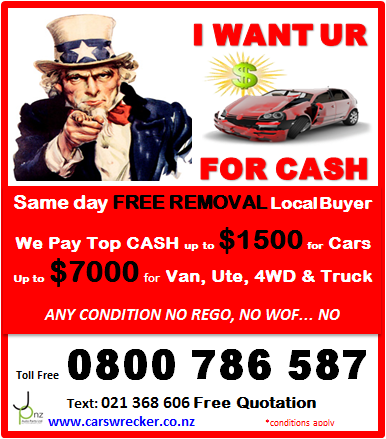 This entry was posted in scrap car and tagged best cash for car auckland, car removal Auckland, car removal for cash auckland, Car Scrap Auckland east, Car Scrap Auckland south, Car Scrap Auckland west, Car Scrap Buyers Auckland, Car Scrap Dealers Auckland, Car Scrap for Money Auckland, car wreckers Auckland, cars for sale auckland, cash for car removal auckland, cash for cars auckalnd, junk car removal auckland, scrap car buyers auckland, scrap car buyers manukau, sell my car Auckland, trucks for cash, used car for cash today auckland, where to sell my used car in AUCKLAND on July 23, 2013 by Cars Wrecker.